Hey stamping friend! I’m sending out a special newsletter today – so I hope you’re on my mailing list! If you’re reading this before 1 pm PST, there’s still time – just click on my Newsletter tab, and sign up! You’ll get today’s special notice, plus my 12 Weeks of Christmas tutorials. Of course you’ll also receive my other monthly newsletters, full of tips, tutorials and specials. What’s so special about today’s newsletter?? Well, I’m announcing 3 Ways for You to Get the New Stampin’ Blends markers, from me! Now, I don’t want to spoil the fun, so right now I’m just going to share with you why I KNOW you’re going to want these new markers. This video features Shannon of the Stampin’ Up! home office, explaining the features & benefits of these awesome new markers. Now, here’s a video done by Carrie in the Stampin’ Up! home office. She’s going to show you how easy the Blends are to use, and the basics of using them. Don’t these look fun to use?! Just a little blending and shading and BOOM! You’re an artist! Speaking of making you look like an artist…you’re going to want to do some colouring with your new markers. I know you’re going to want the limited-edition Color Me Happy Kit! Right now there are 12 different colours of markers, plus an Ivory and Bronze Marker for creating skin tones. There’s also a Color Lifter, to use for moving, blending and removing colour. 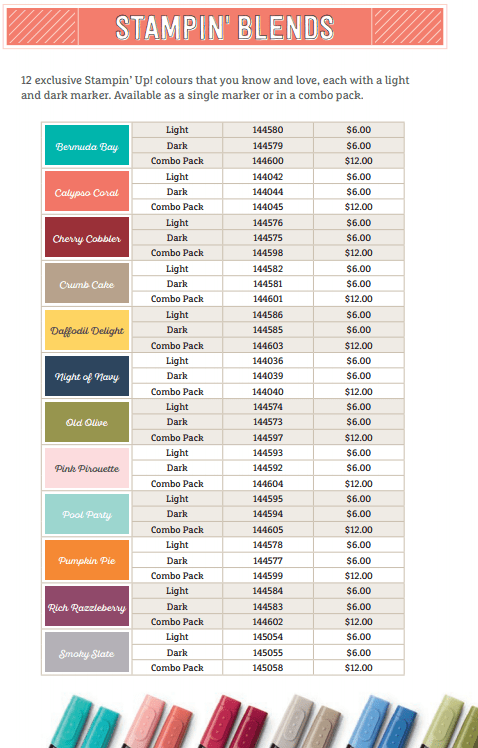 Each of the 12 different colours are all exclusive Stampin’ Up! colours, so you know they’ll coordinate with your projects. They can be purchased separately, or in Combo Packs of a Light & Dark shade. 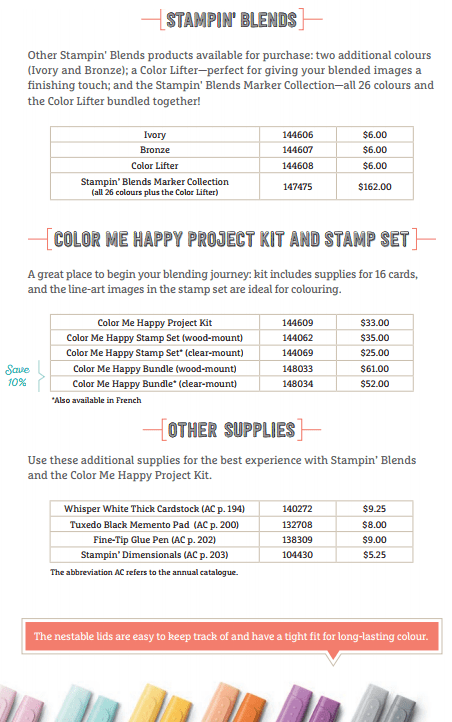 As I mentioned earlier (and in my special newsletter today) the Color Me Happy Project Kit is a limited-time offer; it’s “while supplies last”. So don’t be disappointed! Get your order in now – and don’t forget to take advantage of the fabulous offers in my special newsletter today! Previous Previous post: How Is Your Tic Tac Toe Game? Next Next post: 3 Ways For You To Get the New Stampin’ Blends!